CSMedia_01d, originally uploaded by gserafini. 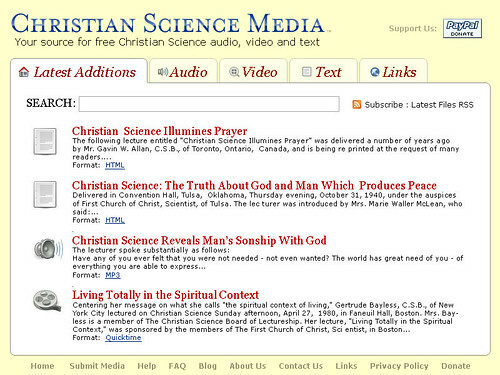 Working with Rachel on a design for a new site that would make free Christian Science Media readily available to the general public. Coming as soon as it can. The logo font is Mrs. Eaves Small Caps from Emigre. This entry was posted on Wednesday, March 8th, 2006 at 4:23 am	and is filed under Artwork, Christian Science, Design, Development, Media, News, Projects. You can follow any responses to this entry through the RSS 2.0 feed. You can leave a response, or trackback from your own site.